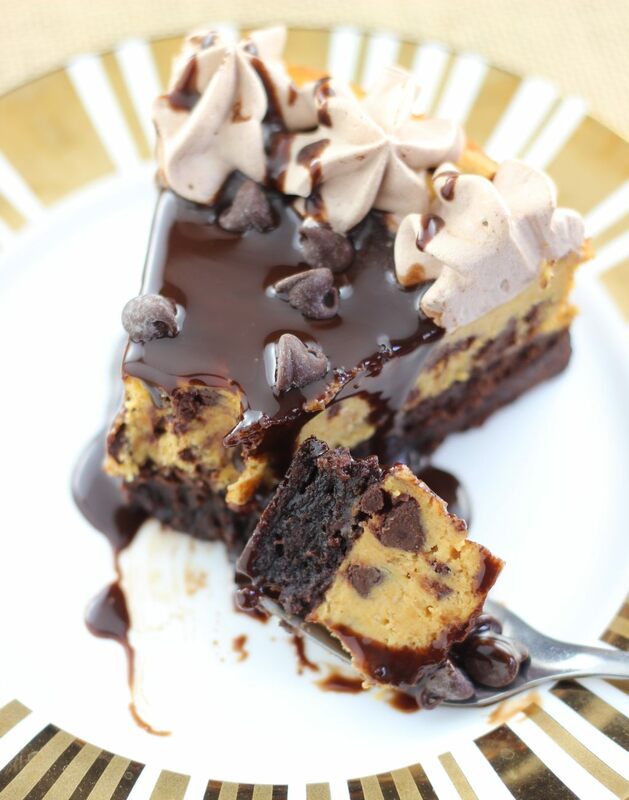 This decadent and surprisingly easy Pumpkin Chocolate Chip Brownie Cheesecake features a layer of fudgy brownie, topped with a layer of pumpkin chocolate chip cheesecake! 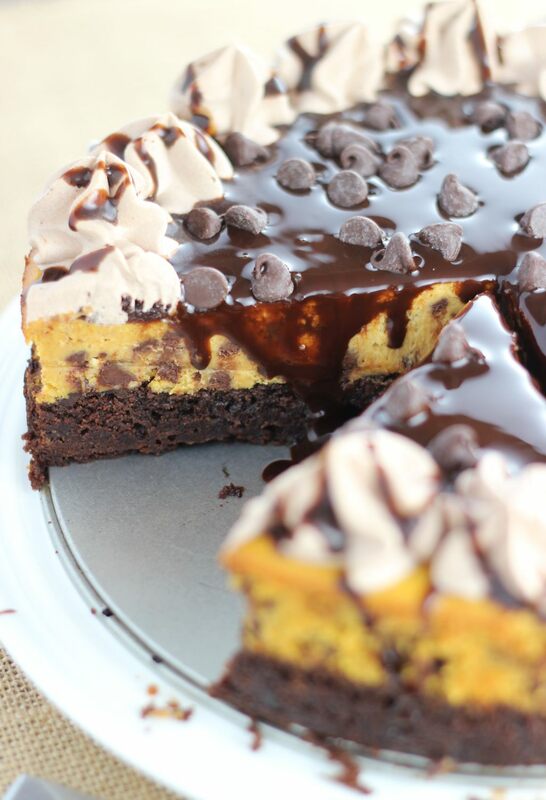 It’s so simple, but just look at this Pumpkin Chocolate Chip Brownie Cheesecake, it’s crazy beautiful!! True to form, I have several pumpkin cheesecake recipes forthcoming… because I never know when to stop. I have to continue to repeat flavor profiles over and over until I feel that I have thoroughly exhausted them. 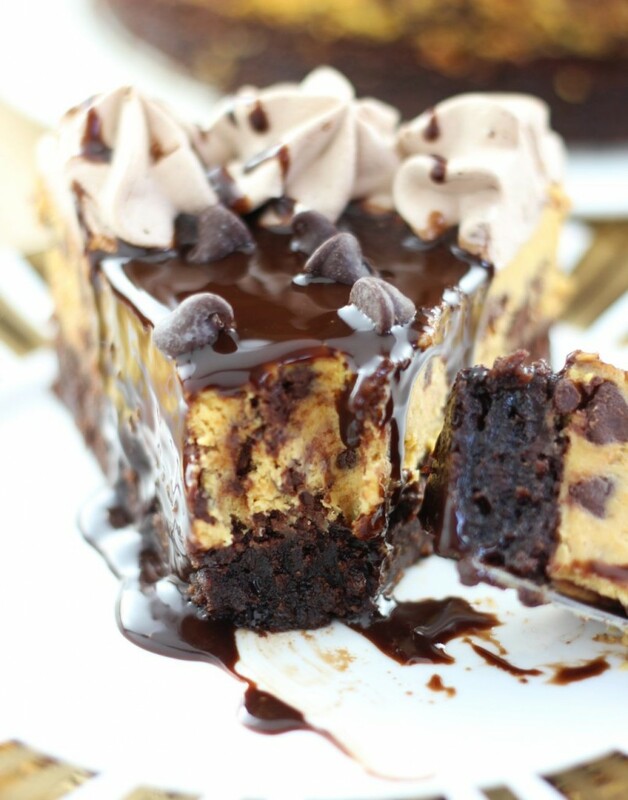 Anyway, today’s is a brownie-bottom cheesecake. I’ve made plenty of brownie-bottom cheesecakes. 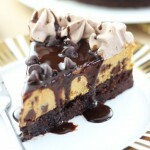 My basic brownie-bottom cheesecake recipe is a staple for me. It’s an entire pan of brownies as the crust – I’ve made it into a Mint Chocolate Chip Brownie Cheesecake, Black Forest Brownie Cheesecake, and Peanut Butter Cup Brownie Cheesecake. It’s such a versatile recipe, and a cheesecake with a brownie base is always a hit. The crust is almost an inch thick! Hey, you guys usually like this stuff too. I’m only a repeat offender with ingredients because y’all also seem into the recipes. 🙂 After all, this Double Layer Pumpkin Cheesecake (no bake) is one of my most popular blog recipes, and it comes together in 10 minutes. It’s awesome. Let’s get one of the pumpkin cheesecake recipes out of the way though, shall we? This way you might not feel beaten over the head with pumpkin cheesecake recipes when I share at least two more over the course of fall. I posted a sneak peek of this Pumpkin Chocolate Chip Brownie Cheesecake on Instagram, and a few minutes after I posted it, my friend Nicole invited me over for brunch. I knew she was after the cheesecake. Shockingly, we still had some left in the fridge, which is pretty rare since cheesecake rapidly disappears in my house, but it’s probably because there were two other kinds of cheesecakes in the fridge as well. So there you go! For a long time, I thought I didn’t like chocolate and pumpkin together. I fought that combo because I didn’t really see the two flavors meshing all that well, and I thought it was just forced and gimmicky. I was wrong. Wrong, wrong, wrong. So very wrong. Chocolate and pumpkin DO belong together, and while I might prefer pumpkin a little better with other flavors, it is AMAZING with chocolate too. I see the error of my ways. 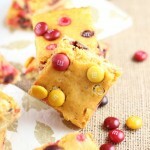 This Pumpkin Chocolate Chip Brownie Cheesecake is perfect proof I was mistaken. 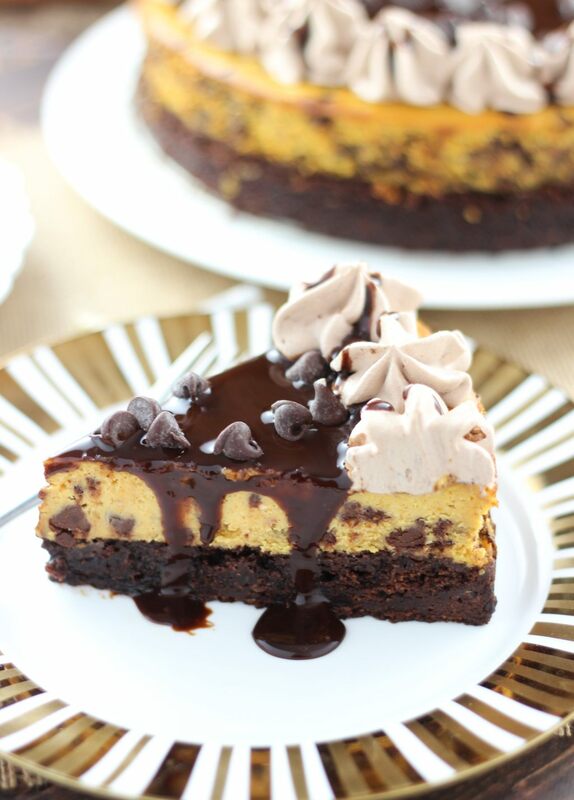 This Pumpkin Chocolate Chip Brownie Cheesecake starts with a thick layer of fudgy brownies. With mini chocolate chips thrown in the batter, the brownie layer is extra ooey-gooey. Next up is a thick layer of creamy and rich, perfectly-spiced pumpkin cheesecake. And more chocolate chips, for good measure. Topped with chocolate whipped cream, chocolate syrup, and a smattering of more chocolate chips, there is no shortage of chocolate and pumpkin flavors in this impressive fall dessert. 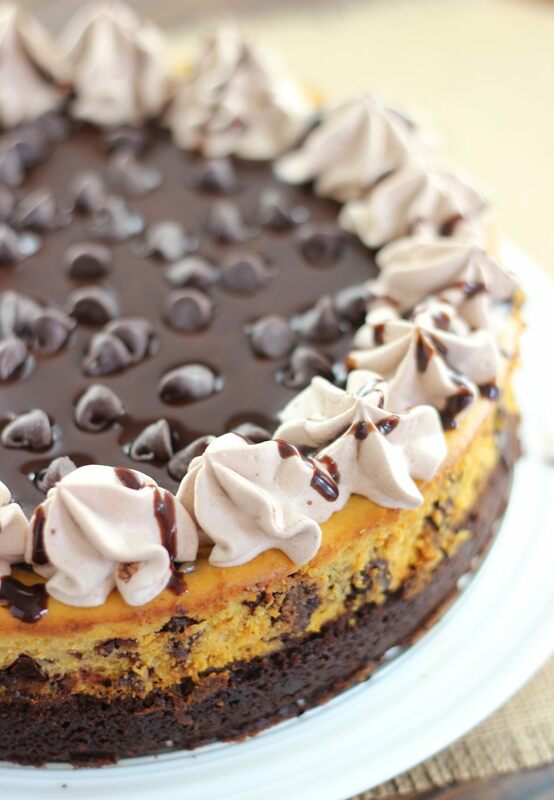 You’ll adore this Pumpkin Chocolate Chip Brownie Cheesecake. It doesn’t hurt that it’s also surprisingly easy to make. I’m not just saying that – it really is. It takes some solid baking time, but the prep work is super simple. You’ll love it, I’m certain, but if nothing else, it’ll get you brunch invitations, and who doesn’t like to be popular, even if it’s because of your cheesecake skills? 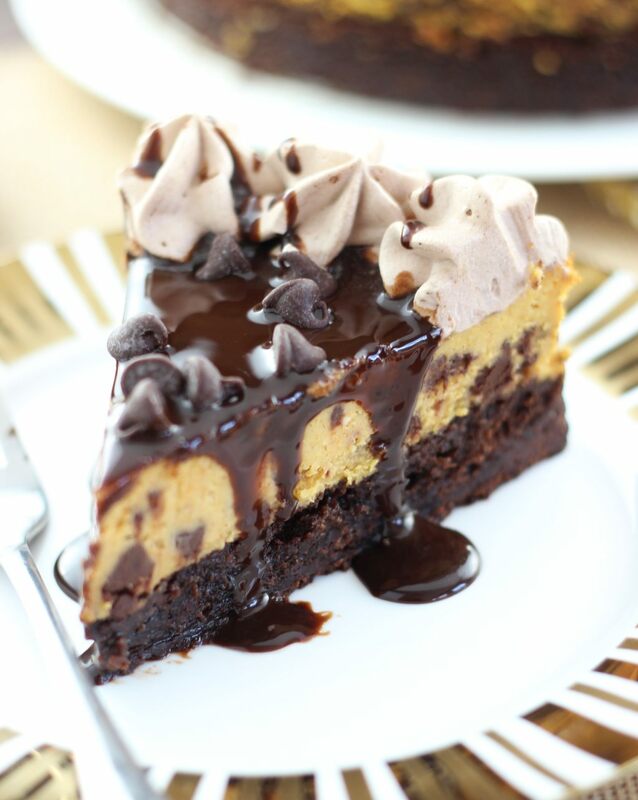 You need to try this Pumpkin Chocolate Chip Brownie Cheesecake recipe!! 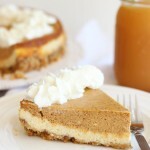 If you love pumpkin cheesecake as much as we do, I really do have quite a few on the blog. 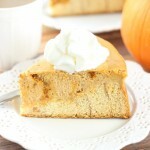 My personal favorite, and a classic staple is this Double Layer Pumpkin Cheesecake (The Traditional). It never fails to ‘wow’. I also have this awesome Cinnamon Roll Pumpkin Cheesecake – it’s pumpkin cheesecake baked on top of cinnamon rolls for crust! These mini Pumpkin Spice Oreo Cheesecakes are awesome – the cheesecake is baked on top of a Pumpkin Spice Oreo. And then I also have this White Chocolate Pumpkin Cheesecake with Gingersnap Crust. That cheesecake is unbelievable. White chocolate is in the pumpkin cheesecake batter, but it’s also drenched in white chocolate ganache – GAH! 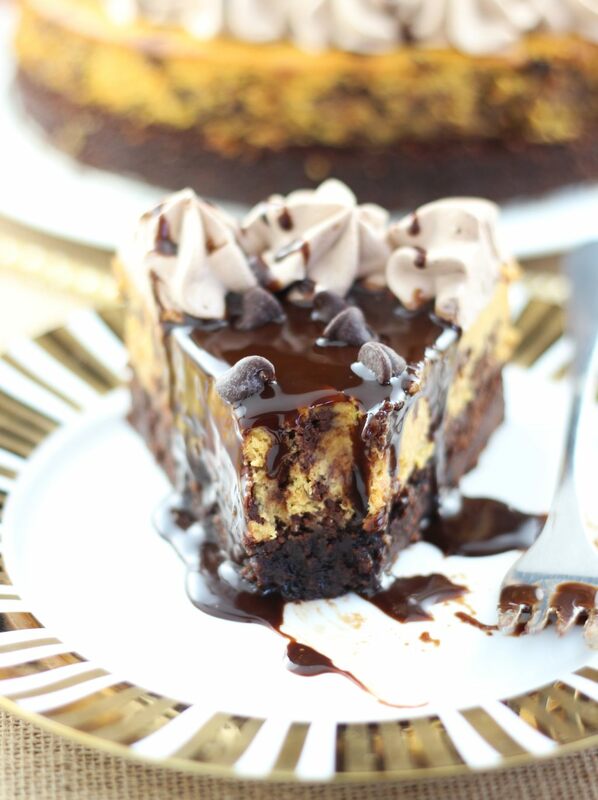 This decadent and surprisingly easy dessert features a layer of fudgy brownie, topped with a layer of pumpkin chocolate chip cheesecake! Prepare brownie mix according to box instructions. For me, this meant combining the brownie mix, water, oil, and egg. Fold in the 1/2 c. mini chocolate chips. Pour the batter into a greased 8-inch springform pan. Bake at 350 degrees for 20-25 minutes, or until a toothpick inserted two inches from the edge comes out with moist crumbs. Add the pumpkin puree, pumpkin pie spice, and cinnamon. Fold in the 1/2 c. mini chocolate chips and 1 c. regular-sized chocolate chips. Bake at 350 degrees for 35-45 minutes or until cheesecake is still slightly jiggly in the center when shaken. In a small bowl, combine whipped topping and cocoa powder until blended. 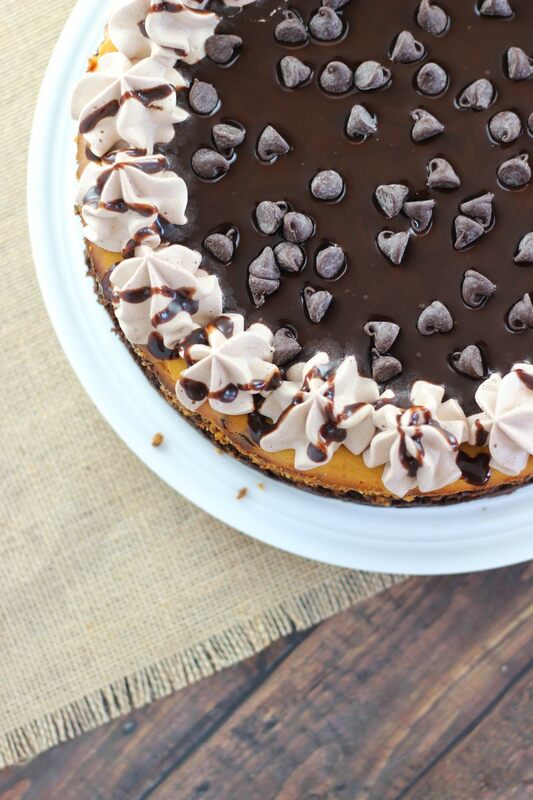 Pipe or spoon the chocolate whipped cream around the edges of the cheesecake, fill the center with chocolate syrup, and sprinkle with chocolate chips. 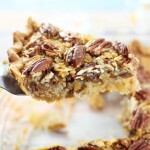 I am swooning over this cheesecake! It’s so decadent! Pinned and shared on FB!! Beautiful pictures! This looks amazing! wow looks really amazing! thanks for sharing on craft schooling sunday! 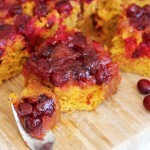 My mouth is watering just looking at these pictures! Thanks so much for linking up with us at Share The Wealth Sunday! I’ve chosen this post as one of my top 5 and you’ll be featured at the next party and on my FB page as well! Have a wonderful weekend! Lol! It’s easier to make than it looks, thankfully!! Yummy! Delicious! I like it! I pinned at the Pinterest board. Thank you for your participation at Tasty Tuesday Creative K Kids.